The city of Troy is one of the most famous cities from Greek mythology; after all it is central to the myths surrounding the Trojan War. The city of Troy though was only a short-lived city, lasting but three generations of the House of Troy, although the Trojan people predated the founding of Troy, and continued after its destruction. The history of the House of Troy and the Trojan people can be said to start with the arrival of Dardanus in Anatolia; Dardanus having left Arcadia during the Great Flood. Dardanus was welcomed by King Teucer, a son of the Potamoi Scamander and the Naiad Idaea. Being the first king of the region later named the Troad, Teucer is often called the first king of Troy. 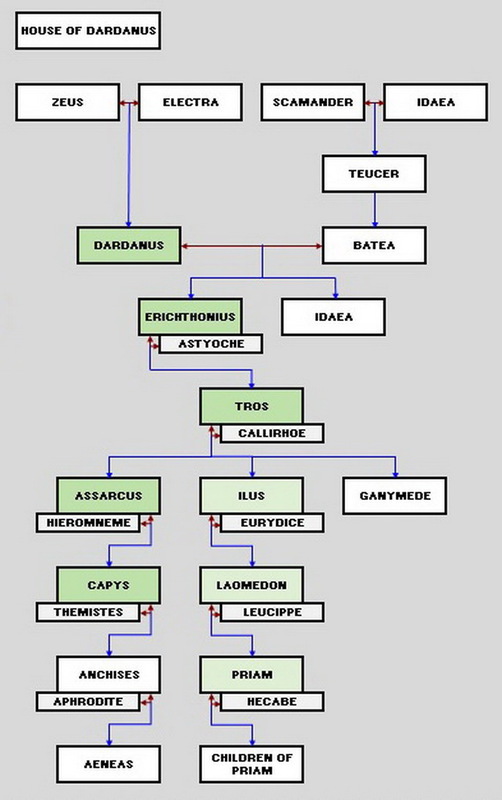 Teucer would give Dardanus land within his realm, and also the hand in marriage of his daughter Batea. Dardanus would build a new city at the foot of Mount Ida, a city that would be called Dardania. With the death of his father-in-law, and also military conquest of his neighbours, Dardanus greatly expanded Dardania, making it comparable to any of the Phrygian kingdoms to the east. 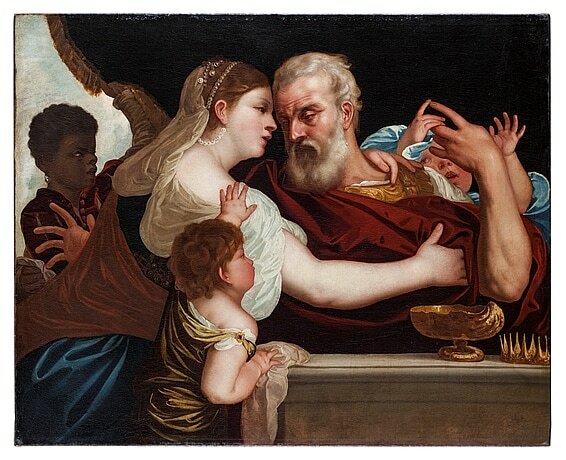 Dardanus would be father to two, or four, children with Batea. The two less often children mentioned were Idaea, the future wife of Phineas, and Zacynthus, the first settler upon the island of Zacynthos. The two more famous members of the royal line were the eldest son Ilus, and second son, Erichthonius. Ilus would predecease his father, and so upon the death of Dardanus, Erichthonius became king of Dardania. Erichthonius was considered the wealthiest king of his day, and by the Naiad Astyoche, would father a son and heir, Tros. As the third king of Dardania, Tros would give his name to his subjects, and so whilst still referred to as Dardanians, the term Trojans also started to be used. Tros would father three sons by Callirhoe, Ilus, Assarcus, and Ganymede. Ganymede is of course a famous figure from Greek mythology, for this Trojan prince was abducted by Zeus, and taken to Mount Olympus. Ilus was the heir to the throne of Dardania, but before his father died, Ilus founded a new city of Ilium (Ilion). Later, the city would be renamed in honour of Ilus’ father Tros, just as the Troad was also named for the third king of Dardania. When Tros died, Ilus did not take up the position of king of Dardania, instead he was satisfied with being the first King of the city of Troy, thus Assarcus became the fourth king of Dardania. Thus the Trojan people were now split into two. Dardania would become the junior city subsequently, although still a noted city within Anatolia. Assarcus would marry Hieromneme, and this marriage would bring forth one son, Capys. The rule of Assarcus was uneventful, but it was in the time of Capys when the Trojan War took place. Capys’ son Anchises was present in Troy during the war, but more famously Anchises’ son, and therefore Capys’ grandson was also present, and this prince of Dardania was Aeneas. The city of Troy would become the dominant city of the Trojans, and Laomedon would become king of Troy upon the death of his father. Laomedon would be responsible for building up the city walls of Troy, having employed Poseidon to do the job, but the foolishness of the king of Troy would lead to his reign being cut short. Laomedon would refuse to pay Poseidon and Apollo for the work they had done for him, and the king would then refuse to pay Heracles when the Greek hero killed the monster sent by Poseidon. Heracles would sack Troy, killing Laomedon and his numerous children; only one son of Laomedon survived the onslaught of the demi-god, and that was Priam, who was ransomed by his sister Hermione. Heracles placed Priam on the throne of Troy, making him the third king of Troy, and the city once again flourished just as it had done under Ilus. The children of King Priam were numerous, and it seemed that the House of Troy was firmly established for the heir to the throne was the courageous Hector. Another son of Priam, Paris, though would bring disaster upon Troy just as had been foretold at his birth, for he abducted Helen bringing forth a thousand ships; and during the war son after son of King Priam would die. King Priam is normally described as the last King of Troy, and indeed the city was destroyed so there was no more Troy to rule. At least one son of Priam survived the war, as did several daughters, thus the House of Troy continued; indeed Helenus would found the city of Buthrotum, before the son of Priam succeeded Neoptolemus as the ruler of Epirus. Dardania also survived, although greatly weakened, and so it was subsequently swamped by Phrygian kingdoms. The most famous son of Dardania though survived the destruction of Troy, and after many adventures, Aeneas would arrive in Italy. Aeneas is of course one of the cornerstones of Roman mythology, and the surviving Trojans would become the ancestors of the Romans.